A complex system of cryolines and cold boxes will distribute the cooling power generated by the ITER cryoplant to clients throughout the installation. Cryogenic technology will be extensively used at ITER to create and maintain low-temperature conditions for the magnet, vacuum pumping and some diagnostics systems. The ITER magnets will be cooled with supercritical helium at 4 K (-269°C) in order to operate at the high magnetic fields necessary for the confinement and stabilization of the plasma. They will be surrounded by a large cryostat and an actively-cooled thermal shield with a forced flow of helium at 80 K. Additionally, large cryoabsorption panels cooled by supercritical helium (4 K) will be used to achieve the high pumping rates and vacuum levels in the cryostat and torus. A cryoplant on the ITER platform will produce the required cooling power, and distribute it through a complex system of cryolines and cold boxes that make up the cryodistribution system. Cryogenics: the branch of physics and engineering that deals with very low temperatures that do not naturally occur on Earth. [The word cryo or cryos (κρύο) is Greek and means "icy cold"]. The cryoplant is composed of helium and nitrogen refrigerators combined with a 80 K helium loop. Storage and recovery of the helium inventory (25 tonnes) is provided in warm and cold (4 K and 80 K) gaseous helium tanks. Three helium refrigerators supply the required cooling power via an interconnection box providing the interface to the cryodistribution system. Two nitrogen refrigerators provide cooling power for the thermal shields and the 80 K pre-cooling of the helium refrigerators. The ITER cryogenic system will be capable of providing cooling power at three different temperature levels: 4 K, 50 K and 80 K.
Helium exists in a liquid form only at extremely low temperatures. 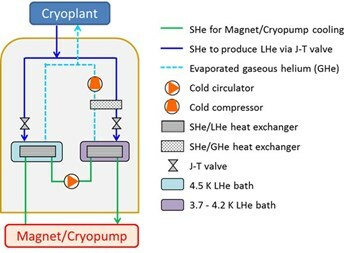 Baths with liquid helium (LHe) at 4.5 K and at 4.2 K (down to 3.7 K) provide the cold source to extract and transfer heat from the components to the cryoplant. Forced-flow supercritical helium (SHe) circulates through ITER components to remove heat and provides the required low temperature environment. The distribution of cooling power is accomplished through cryodistribution boxes with helium circulating pumps for the cooling of the magnets and cryopumps, and a complex system of cryogenic transfer lines—located both within the Tokamak Building, within the Cryoplant buildings, and between the two. The cryogenic system has been designed to guarantee cooling and stable operation for ITER magnets, cryopumps and thermal shields despite unprecedented dynamic heat loads due to magnetic field variations and neutron production from the pulsed fusion reactions. It will operate over a wide range of ITER plasma scenarios, from short plasma pulses (a few hundred seconds) with enlarged fusion power (700 MW) to long plasma pulses of 3000 s with 365 MW of fusion power. Prior to operation, the ITER cryogenic system will provide the gradual cooldown and fill of the magnets and thermal shields and the cooldown of the cryopumps that are used to achieve vacuum in the cryostat and vacuum vessel. 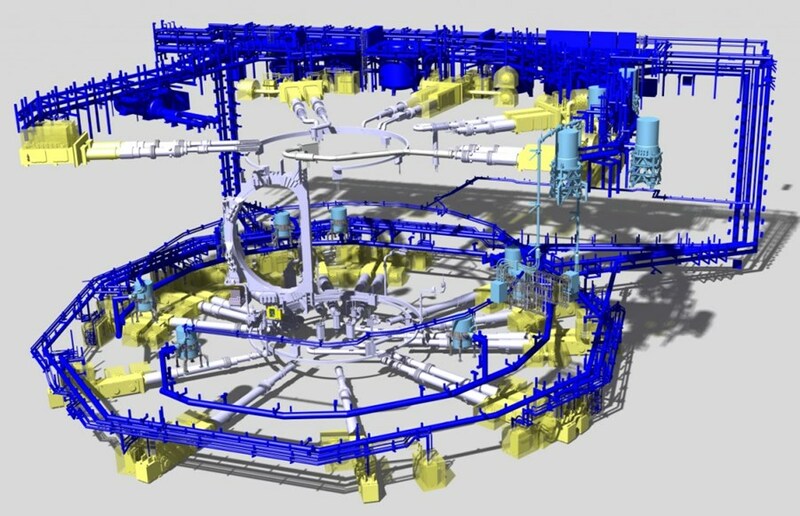 The ITER cryogenic system will be the largest concentrated cryogenic system in the world with an installed cooling power of 75 kW at 4.5 K (helium) and 1300 kW at 80 K (nitrogen). After the Large Hadron Collider at CERN, it is the largest cryogenic system ever built. 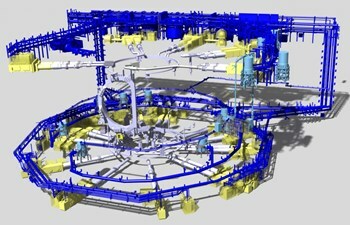 The design of the ITER cryogenic system was validated during tests at existing facilities around the world. The cryoplant is under construction now. Visit the related BUILDING ITER page here.